What if CEOs — not software development and delivery leaders or CIOs — held the keys to the fast, high-quality software delivery that is so crucial to digital business? Many software leaders tell us their progress is limited by culture, organizational barriers, and counterproductive metrics — the province of CEOs. Rather than just observing and hoping for good results, CEOs must actively participate to foster the software capability their firms need. CEOs must master software as a key corporate resource. Software is no longer just for back-office record keeping; it powers engagements with customers, advertising, supplier linkages, product development, and all other operations. CEOs must impose measures of business return on software investments — and end the madness of software metrics. No more holding software teams to schedules and budgets and hoping for the best. CEOs must create new partnerships with their software leaders. Read on to learn how and why. Omnichannel shopping (even within a single location). Bots that service customers. Equipment that phones home. Self-service everything for customers. As CEOs push “digital” initiatives at their firms, they elevate software delivery from a cost center to a strategic capability. Digital is a fancy term for customer innovation and operational excellence that achieves financial results. CEOs are measured by their financial results. Software is the fuel for digital transformation, so poor software capability is now a barrier to CEO success. That’s reason alone for CEOs to engage with software leaders to ensure that they are aligned and progressing. But there’s more. Neither software leaders nor CIOs can catapult their software organizations into the digital era without the right CEO support. CEO actions, or lack thereof, can stymie progress toward the software capability that digital business demands. Why? Software success depends on factors that only CEOs control. CEO control starts with funding for software initiatives — buy, build, and everything in between, plus modernization of outdated software. 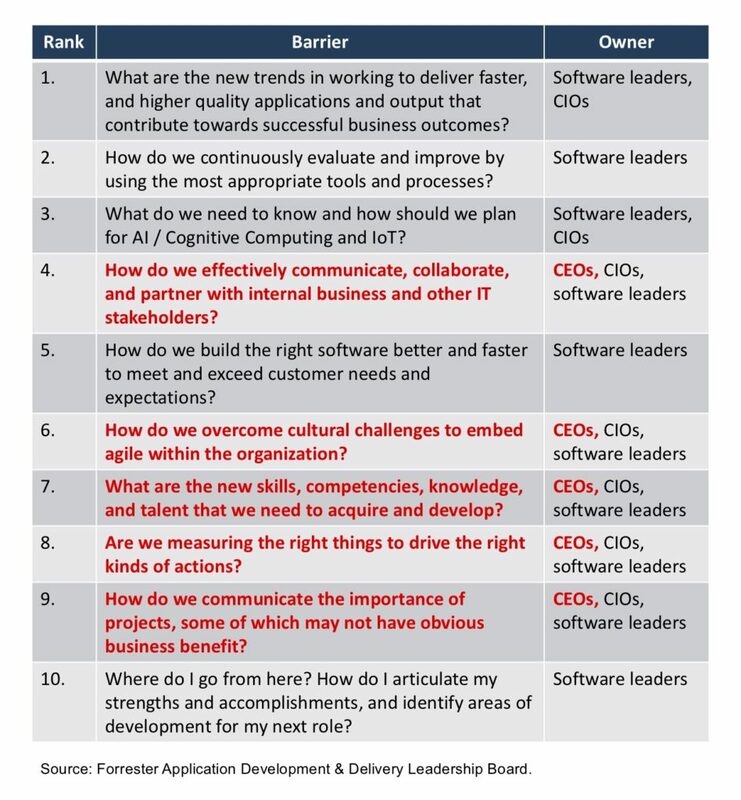 We track software leaders’ views on the top 10 barriers to improved software delivery (see Figure 1), with the barriers owned by CEOs highlighted in red. “Things are moving so fast in our market,” said the CEO of a professional services firm. “I live in terror of being left behind.” Speed of software delivery is a leading indicator of health and vitality in a software-delivery organization and a signal that a software team’s digital transformation is underway. 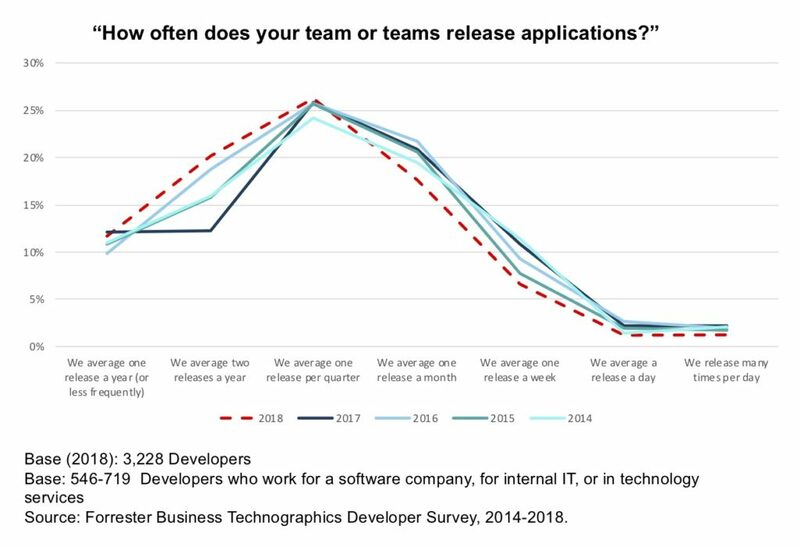 During the past five years, developers have made almost no progress in their ability to deliver software quickly (see Figure 2)! CEOs can’t run the specialized domains of their business any more than a software leader can run the company. 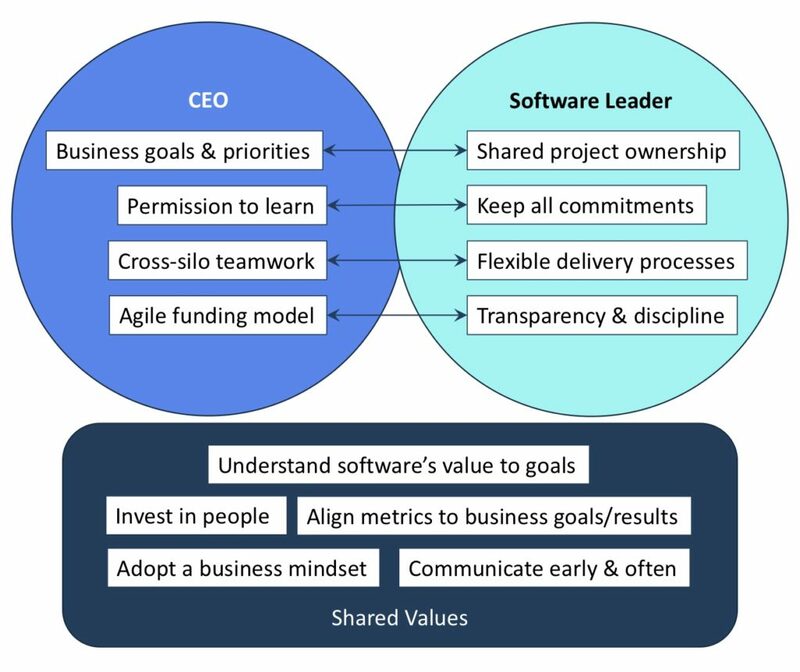 A software capability that serves the enterprise’s needs depends on a partnership between CEOs and software leaders that replaces a passive CEO role, static reviews, cost-cutting focus, and lack of trust with a dynamic understanding of software’s role in achieving CEO goals and prompt software responses to implement the CEO’s objectives. The partnership does not require CEOs to become software experts but rather be curious and committed enough to ask tough questions of software and technology leaders and insist that software investments be managed by business metrics. Define and maintain an understanding of software’s contributions to the CEO’s goals. CEO communication of goals and priorities are vital but not enough. CEOs must meet with their software leaders as often as needed if either alignment is poor or the business is in a high state of flux. Software leaders must properly interpret those goals for their organizations, as well as contribute to those goals and priorities. Establish the few, vital measures of success. Business measures come next. CEOs and software leaders must identify the one or two measures of progress toward strategic goals or to achieve business returns. Below this surface, software leaders will create the detailed metrics they need to run their software organizations. Everyone communicates early and often about priorities, plans, and progress. Businesses face changes and challenges every single day, many of which require fast action in software. Both the executive team and software leadership must communicate about the meaning of events to their shared priorities as often as needed. For many, the traditional monthly reviews will be far too infrequent. Commit to keeping the talent pool vital. CEOs focus on adding leaders and advisors, including board members, that drive an effective software strategy. Software leaders ensure that their software pros develop new skills and keep their talent pool fresh and current. Set business goals and priorities. Set out clear, concrete goals for the business. In some cases, your goals may be expressed as new ways of doing business. One CEO seeking to transform an insurer distributed a book about his vision to all employees — and did a tour to ensure that they understood it. In other cases, your goals may seek operational improvements and require less elaborate communication. Insist on cross-silo teamwork. Modern software is a team sport, with the best ideas and results coming from collaboration across departments. Your role is to insist on teamwork and sometimes even to force it. One CEO cited his ad hoc silo busting as one of his most important contributions to his firm’s software strategy. Implement shared ownership. Implement software processes that give business experts shared ownership of software outcomes. The change will demand challenging commitments of time and resources from business leadership. At one big financial firm, these working adjustments unfolded over two years before settling into a pattern that everyone was comfortable with. Keep all commitments. In exchange for permission to learn, software leaders must meet commitments to keep the lights on, maintain the technology landscape, and deliver new apps as promised. They must create space within their budgets for research and learning by their staffs without compromising commitments. Implement flexible delivery processes. Software delivery processes that can flex to meet unpredictable business schedules and multiple stakeholder perspectives support cross-silo teamwork. These processes demand a new role: business-savvy product managers that sustain software initiatives within functional domains. In one firm, software leadership acceded to demands from business leaders to staff the product manager role! Commit to transparency and discipline. Given the ability to manage spending within product (or other) envelopes, software leaders must commit to transparency with the CEO and the business. For the CEO, the key is progress toward his or her priorities in time and measures of business return on software investment. Functional business leaders will require more detail about software in their areas. Disciplined software activities are crucial to controlling risks, squeezing the highest possible value from every dollar invested, and automating to free up funding for innovation. Our CEO and software research is ongoing. Please send feedback, as well as comments on where we should take it next. And if you’d like to share your story and perspective with us, email us at jrymer@forrester.com and jhammond@forrester.com.